Each safari tent has a fire pit, barbecue, and picnic bench on a covered balcony. It also features its own kitchen shed which holds a gas burner for cooking, a barbecue, kettle, plates, cutlery, utensils, frying pan, saucepan, glasses and mugs, cool box with ice packs, fire blanket and carbon monoxide detector. There is enough space to lock up bikes and store wellies and no electricity. Unfortunately, so we can preserve local fauna, flora and wildlife, we do not accept dogs. 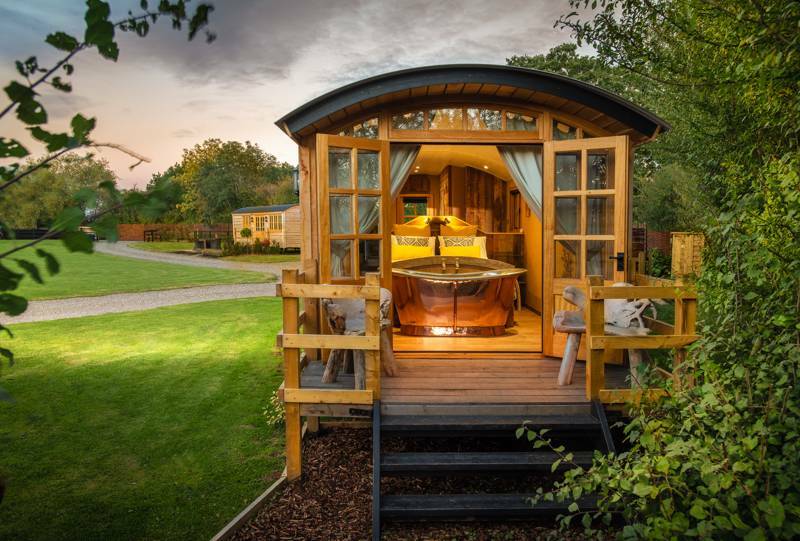 What actually is glamping? To us outdoor aficionados it’s one of life’s great questions and, like all big conundrums, the answer is brilliantly ambiguous. Well, it’s glamorous camping isn’t it? Camping out but with better facilities than sleeping rough. So a site with a ready-pitched expedition tent and a portable loo dumped unceremoniously alongside could be considered glamping right? Well, that’s certainly stretching things a little, but thankfully this new find has gone in an altogether different direction. 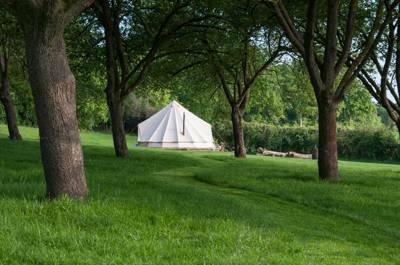 Set on a working farm in rural Worcestershire, Canvas and Clover is what true glamping should be. 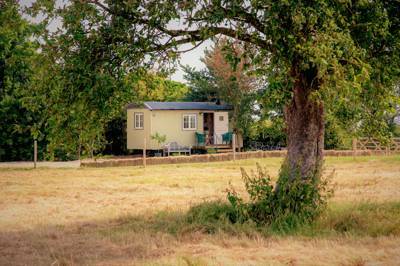 Owners, Matt and Wendy, created the site in response to their long-term camping wish – to go on holiday somewhere lacking in modern, gadget-ridden distractions yet avoid having to spend their time sleeping on the floor and arguing about whose turn it was to put up the tent. The resulting site is fabulous. 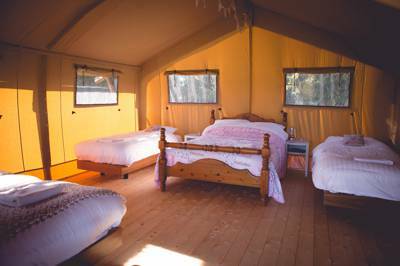 Spread around a meadow, in a quiet area of the farm, the 10 well-furnished safari tents are each set on a sizeable plot of land with a deck, firepit and picnic table outside each. Inside, there's a double bed and three singles, with extra space saved by separating the kitchen, which is outside in a seperate kitchen shed with a barbecue, gas burner, pots, pans and utensils. 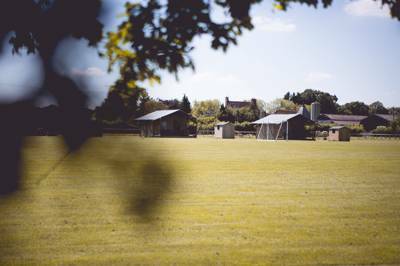 On hand there’s a clean, modern shower block, containing six individual rooms each with a toilet, shower and sink, while a covered barn also houses a cosy communal space, with a stash of games including boules and giant jenga, children's books and a telescope. Not that much time is spent indoors. 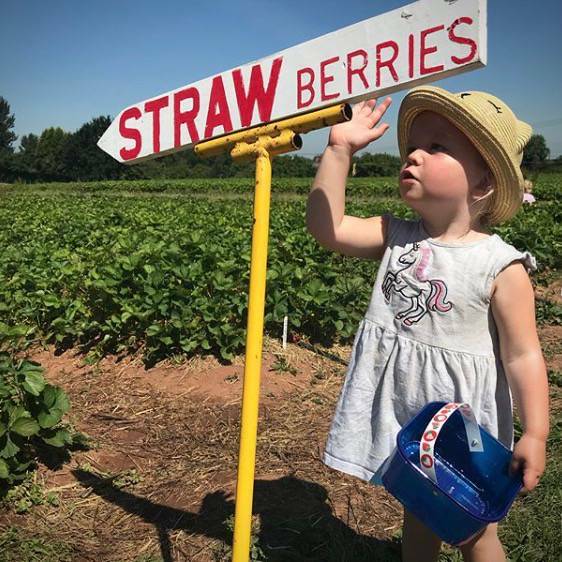 When the sun’s out, the field has endless room to boot a ball around or fling a frisbee, and the surrounding views – across open farmland garnished with hedgerows and mature trees – invite you out onto the footpaths that lead directly from the farm. Indeed, the views make it easy to forget that the city of Worcester is actually surprisingly close by. On the way, re-route via the beautiful ruins of Witley Court, an English Heritage owned manor that was destroyed by a fire in 1937, but still boasts intricate parterre gardens and extravagant water fountains. 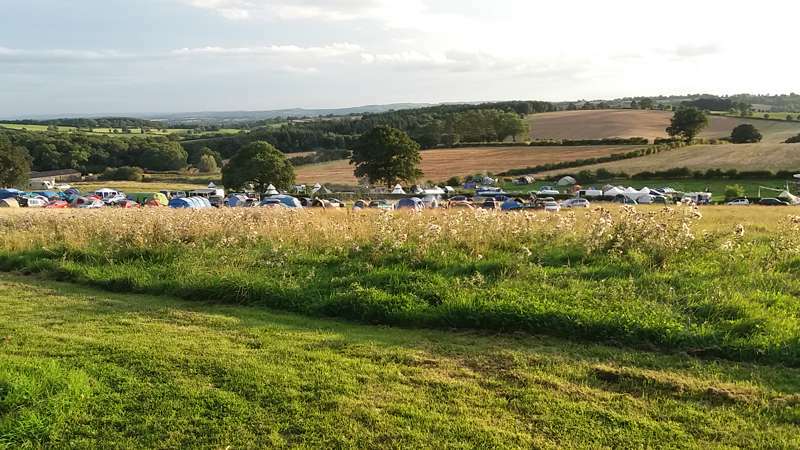 Then delve into the historic county capital itself, boasting a compact and easily walkable town centre with a good range of independent restaurants if you decide to take an evening off from scoffing wine around the campfire! 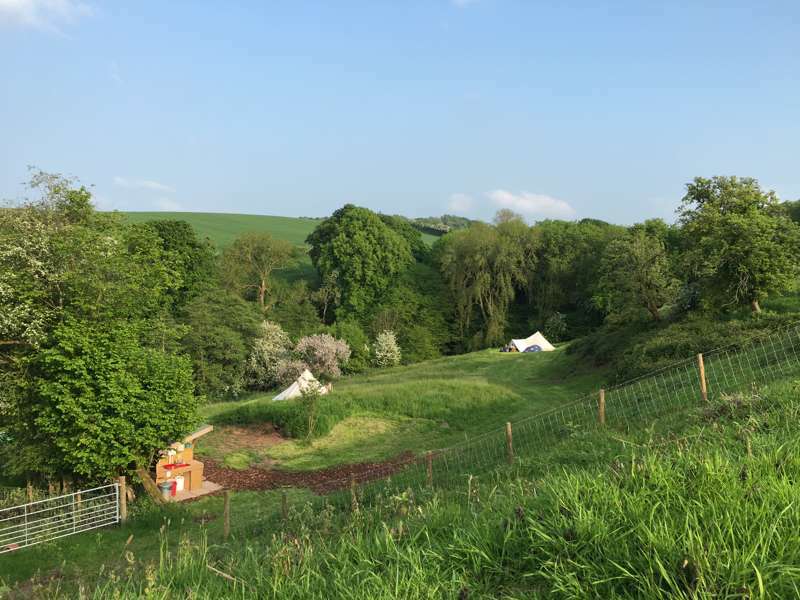 We are an eco-friendly, family run, glamping site with ten furnished Safari tents, each with a garden shed, outdoor seating, barbecue and fire pit, based in a five acre car free field on a working farm. For latest availability and best prices for Canvas & Clover, please use the Date Search above. 10 Safari tents, each sleeping 5 people. 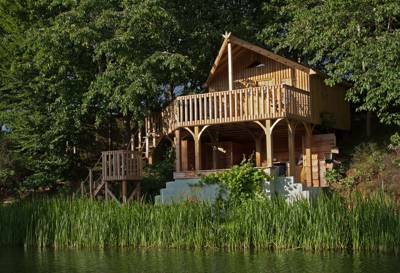 10 safari tents, each with a double bed and 3 singles (all bedding and linen provided); covered decking area; picnic bench; fire pit (starter pack of logs provided); separate kitchen shed with BBQ (charcoal provided), gas burner, pots, pans, utensils, crockery and cutlery. There's a shower block with 6 individual rooms, all containing a shower, a toilet and a sink. There's a washing up area and a small shop that sells locally sourced and fair trade produce plus all the basic essentials. A small, covered barn acts as a communal space with sofas, tables and phone charging points. The Cob House (01886 888517) is a short distance away where you can visit animals such as alpacas, reindeer, pigs and chickens, grab something to eat in the café, or take part in one of the activities on offer which include fishing and archery. The Severn Valley Railway (01299 401776) is a short drive away where you can board one of the steam trains and travel along the heritage railway. Visit the West Midlands Safari Park (01299 402114), slightly further away but well worth a day trip, where you can drive through the safari in your own car or join one of the tour buses to see the large collection of exotic animals that are housed there. The kitchen 'garden sheds' each have a BBQ and a gas burner for cooking on, and plates, pots pan and cutlery are provided. For breakfast, you can order a traditional cook-yourself breakfast basket or there's a continental option. Alternatively, on Sundays, bacon baps are made to order and delivered to your tent. Canvas & Clover also has a wood fired pizza oven, available for homemade fresh pizzas on a Friday night, while a local dairy farm just down the lane has a traditional Thai takeaway (07583 163191) which delivers to your door. Around a 30 minute walk across fields or a 3 minute drive – you'll find The Red Lion (01905 620236), a country pub that serves hearty lunch and dinners with an afro-Caribbean speciality. The Holt Fleet (01905 620286) is a great pub for a special occasions, located in a beautiful setting right next to the river Severn, serving lunch, dinner and a particularly good carvery on a Sunday. 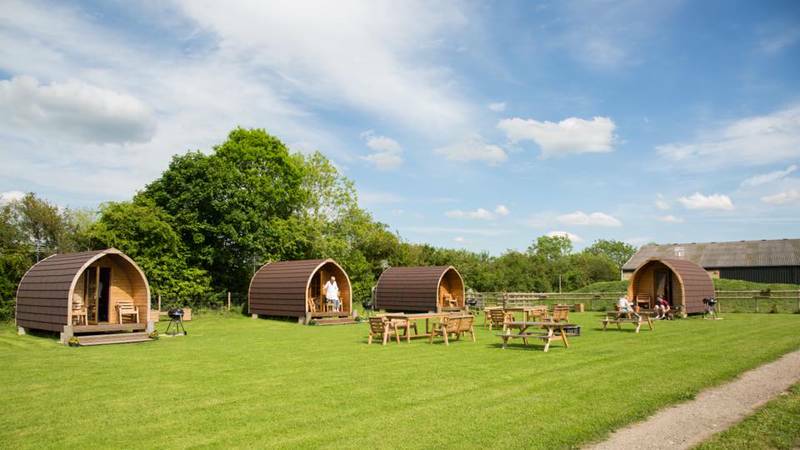 5-man safari tents from £95 per night midweek and £105 per night at weekends. Canvas and Clover is about 20 minutes from the M5 junction 5, and 15 minutes from Worcester near the village of Holt Heath. From the Red Lion pub in Holt Heath village, head down the A443 towards Tenbury. After ½-mile take the turning signed Ockeridge and Wichenford on your left. After ¼-mile on your left you will see a track and a Canvas and Clover sign. Go down the farm track and the car park is on your left. The nearest train stations are Droitwich, Worcester Shrub Hill, and Worcester Foregate Street, which are each approximately 15 minutes away by car.